They say we can’t escape our past — no matter how much we change, we still have the memory of what came before. The same can be said of our cells. Mature cells, such as skin or blood cells, have a cellular “memory,” or record of how the cell changed as it developed from an uncommitted embryonic cell into a specialized adult cell. Now, Harvard Stem Cell Institute researchers at Massachusetts General Hospital (MGH), in collaboration with scientists from the Institutes of Molecular Biotechnology (IMBA) and Molecular Pathology (IMP) in Vienna, have identified genes that, when suppressed effectively, erase a cell’s memory, making it more susceptible to reprogramming and, consequently, making the process of reprogramming quicker and more efficient. The study was recently published in Nature. 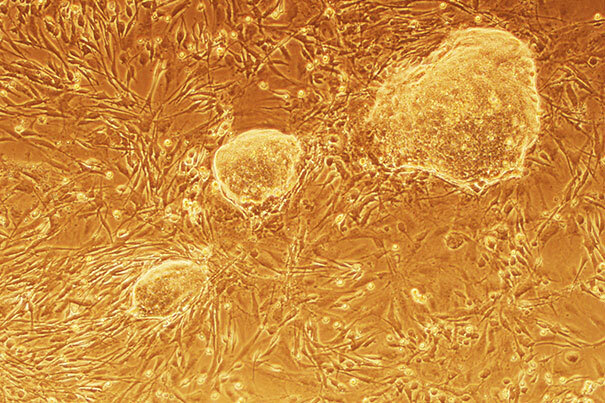 “We began this work because we wanted to know why a skin cell is a skin cell, and why does it not change its identity the next day, or the next month, or a year later?” said co-senior author Konrad Hochedlinger, an HSCI principal faculty member at MGH and Harvard’s Department of Stem Cell and Regenerative Biology, and a world expert in cellular reprogramming. Every cell in the human body has the same genome, or DNA blueprint, explained Hochedlinger, and it is how those genes are turned on and off during development that determines what kind of adult cell each becomes. By manipulating those genes and introducing new factors, scientists can unlock dormant parts of an adult cell’s genome and reprogram it into another cell type. However, “a skin cell knows it is a skin cell,” said IMBA’s Josef Penninger, even after scientists reprogram those skin cells into induced pluripotent stem cells (iPS cells) — a process that would ideally require a cell to “forget” its identity before assuming a new one. Cellular memory is often conserved, acting as a roadblock to reprogramming. “We wanted to find out which factors stabilize this memory and what mechanism prevents iPS cells from forming,” Penninger said. To identify potential factors, the team established a genetic library targeting known chromatin regulators — genes that control the packaging and bookmarking of DNA, and are involved in creating cellular memory. Hochedlinger and Sihem Cheloufi, co-first author and a postdoc in Hochedlinger’s lab, designed a screening approach that tested each of these factors. Of the 615 factors screened, the researchers identified four chromatin regulators, three of which had not yet been described, as potential roadblocks to reprogramming. In comparison to the three- to fourfold increase seen by suppressing previously known roadblock factors, inhibiting the newly described chromatin assembly factor 1 (CAF1) made the process 50- to 200-fold more efficient. Moreover, in the absence of CAF1, reprogramming turned out to be much faster: While the process normally takes nine days, the researchers could detect the first iPS cell after four days. By suppressing CAF1 the researchers were also able to facilitate the conversion of one type of adult cell directly into another, skipping the intermediary step of forming iPS cells, via a process called direct reprogramming, or transdifferentiation. Thus, CAF1 appears to act as a general guardian of cell identity whose depletion facilitates both the interconversion of one adult cell type to another as well as the conversion of specialized cells into iPS cells. In finding CAF1, the researchers identified a complex that allows cell memory to be erased and rewritten. “The cells forget who they are, making it easier to trick them into becoming another type of cell,” said Cheloufi. NASA satellite reveals a more prganized Tropical Cyclone Sagar?